Radiant heat has recently come into the spotlight as an efficient and cost friendly method to heat almost any area. It is a product for both businesses and consumers that allows safety, flexibility, and comfort. From interior applications like heated floors to snow melting systems like Warmzone’s industry leading ClearZone snow melting system, there are many ways a radiant heat system can improve your home or business in the cold winter months. Knowing how a radiant heat system works and what components are needed are some of the first steps in purchasing a system, but the most important aspect of the process is installation. That’s why Warmzone offers free installation training for installers. Proper installation is crucial to ensure a radiant system functions safely and as intended. Proper installation also ensures the longevity and optimum performance of the system. Since the correct installation is so important, get started here with some information from the experts at Warmzone to help assure your installation goes smoothly. A properly installed radiant heat system begins with the components. When installing radiant heat under flooring, a heating element is the first component needed. 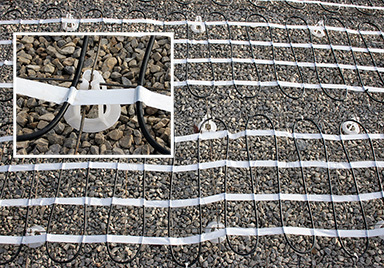 Warmzone’s ComfortTile heat cable is perfect for custom floor heating projects. The heat cable is available on spools or pre-spaced in easy-to-roll-out mats. These mats are simply rolled out and laid over the subflooring. Keep in mind that when installing the cable/mats, it is important that the cable is never cut or damaged. With Warmzone’s ComfortTile floor heating systems, superior components are standard. ComfortTile cable and mats are suitable for almost any flooring, and Warmzone’s programmable thermostats are designed specifically for radiant heat systems. They are simple to use and include an installation wizard for a quick and painless installation. A thermostat from Warmzone also allows for troubleshooting by exporting your information to the web for technical support. Automated snow melting systems require heating cable, a contactor panel, and an aerial or in-ground sensor. These systems use the aerial or in-ground sensor to detect precipitation and temperature. When weather conditions warrant, the sensor triggers the system and power is sent to the heat cables. The system runs until the area is clear and then automatically shuts down. Aerial sensors are used for most home installations, while in-ground sensors are more often used for commercial applications. This makes an automated system a great way to save time, increase safety, and keep power costs low. An automated snow meting system can require extra consideration when installing, so it is important to work with a provider that includes complete system design and layout services. This includes the proper materials and information necessary for the electrician, such as load calculations, breaker sizes and number of breakers. By working with Warmzone you’ll be completely prepared before any installation takes place. 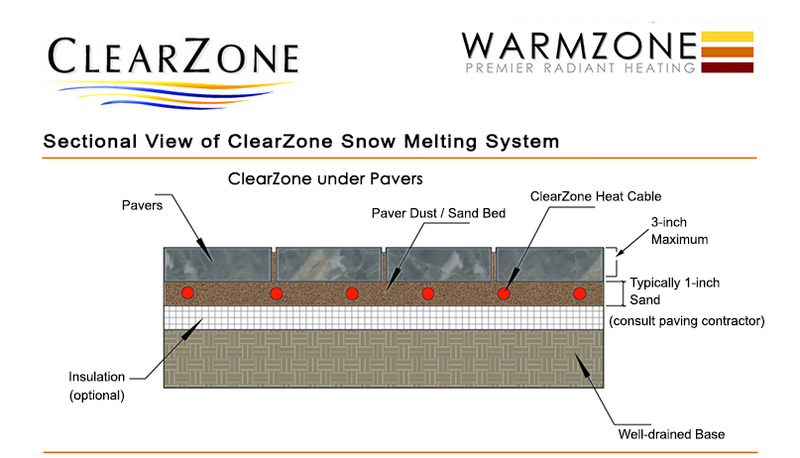 The ClearZone snow melting system is a proven industry leader, and includes unrivaled installation support from Warmzone. These systems can be put into driveways, sidewalks, steps, loading ramps, or just about any area that needs to be heated. When choosing and installing a snow melting system, it is important to make certain that you are using high quality, versatile, and sturdy components. At Warmzone, ClearZone snow melting heat cable is also available on spools for custom configurations, or mats for larger areas. Warmzone’s ClearZone snow melting heat cable is a twin conductor resistance heat cable that allows it to be installed into almost any medium. Special ClearZone cable is also available for installation in high temperature asphalt applications. Great products will only work if an installation is done completely and properly. 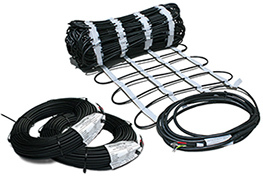 When laying out the cable for your system, it should be done carefully. Installers should be careful with the use of items such as metal rakes that may damage your cable. It is important once again to be sure you do not cut the cable, and the cables are spaced properly and never touching. (Generally, cables should be 3-4 inches apart, depending on your system.) The cables must be properly secured to the remesh as well. To keep the cable from resting on the ground, place MeshUps plastic chairs under the remesh. These supports keep the cable off the ground during concrete pours and ideally, keeps the cable 2 inches from the surface being heated. This step prevents suboptimal performance and will help maintain the soundness of the cable in your snow melting system. If your cables are touching or not installed appropriately it can ruin the cable and make your system inoperable. Another important way to avoid an inoperable system is to test your cables when you receive them, as well as throughout installation. When installing your aerial sensor, it is important for proper functioning that the sensor is unobstructed from the weather, so it can accurately detect temperature and precipitation. After installing your snow melting system or any radiant heat system purchased from Warmzone, fill out your warranty card. This is a step that many customers forget. A snowmelt system can be installed by anyone, but the value of installation training and support is immeasurable in helping to avoid confusion and mistakes while installing. Warmzone is the industry leader in installation support. Not only can you or your installer contact a Warmzone professional at 888-488-9276 at anytime, you will also have access to other industry leading installation help that can make your installation quick and simple. With Warmzone’s professional design services, you can receive a detailed AutoCAD, which includes all the details of your system, from layout, to the power requirements, and all of the technical specs. It helps to ensure the proper installation of your system. If you have questions about your components or system layout, Warmzone has technical support experts on staff ready to help. Warmzone also has videos and general installation overviews available. Technical guides and installation manuals are also available online. If you are more interested in training prior to installation, check out Warmzone University. Warmzone university is completely free and has personal installation training that you can complete online with your instructor. You can also take the training in person at Warmzone’s office in Salt Lake City, Utah. An installation expert is also available to speak to at anytime at Warmzone, or if you need an electrician or contractor to help with installation, Warmzone can connect you with one in your area. Warmzone understands the importance of installation and has the options to make sure your system is installed correctly. Check out Warmzone’s industry leading services. If you’re interested in a free quote or have other questions, contact a professional today at 888-488-9276. Do NOT place asphalt that is higher in temperature than the cable’s maximum rated temperature on the heating cables. Heating cables should be securely fastened so they do not move or shift during the embedment process. Do NOT use a track application machine on the asphalt. Rubber tire applicators are okay as long as the asphalt temperature is below the maximum rated temperature for the heating cables. The operating weight of the asphalt roller should not exceed 1,000 pounds. (The heat cable is designed to handle 8.9kN before the insulation is damaged, which will cause the cable to fail.) NOTE: A walk-behind roller imparts a force of between 5-18 kN. Use a small power roller to compact asphalt over cable on sand, concrete, or ½-inch aggregate. A smaller roller will take more time, but decreases the chance of damaging the heating cable. A roller with 30 kN or less is allowable when heating cable is in concrete and the concrete is then covered is asphalt. When compacting/rolling on a grade, do not stop the roller. Stopping and resuming the roller may stretch and break the heat cable. Do NOT dump large quantities of asphalt on small sections of the heating cables. Doing this may cause damage to the cable because of excessive, focused heat. Ideally, the asphalt should be applied by hand. Do NOT cut or alter the heating cable. Mat tape may be cut, but the heating cable must never be cut. Embed all of the heating cable and the splice in the asphalt. Allow asphalt to cool to a temperature of approx 212°F (100°C) before applying directly over the cable and splice. 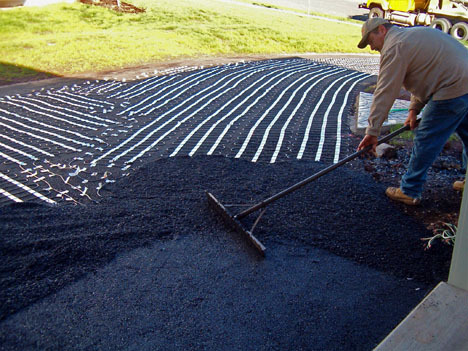 Manually lay the asphalt and spread the material evenly around and over the heating cables. 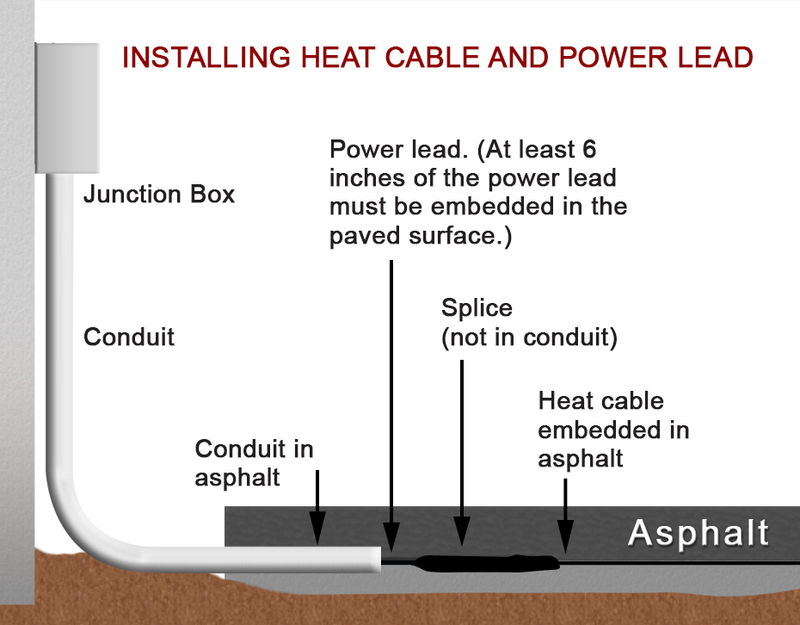 Heating cables are normally covered by 2-inches of asphalt. Leave a buffer of 4 to 6 inches of unheated asphalt around the edge of the heated area. This allows for adjustment of paving surface edges without damaging the heating cable. It is important that the snow melting system be wired by a licensed, qualified electrician and in accordance with local laws, codes, regulations, and NEC guidelines. Ground sensors/cups should not be exposed to temperatures above 80°C (176°F). A perimeter of a maximum of 12 inches of asphalt should exist around the embedded cables. This allows for adjustment of the paving surface edge without damaging the heating cable. 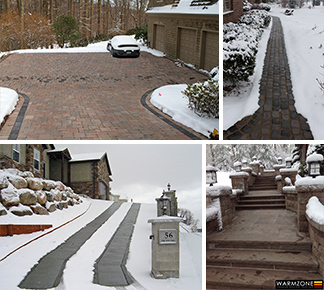 For more information about installing heated driveways and snow melting systems, visit Warmzone’s Installation Overviews web page. 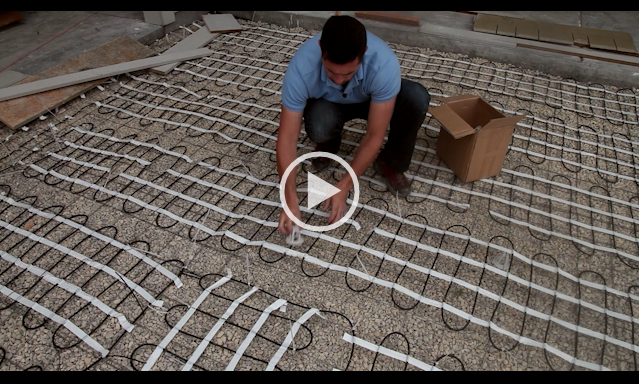 Warmzone also provides a host of radiant heat installation videos online as well. Call us today for more information at 888.488.9276. Ensure that all sharp stones and debris are removed from the area where the heating cable will be installed. Place the remesh in preparation of the concrete pour. Lay the cables/mats according to the plan and fasten them to the remesh or rebar (using plastic zip-lock ties) so that they do not move during the concrete pouring. 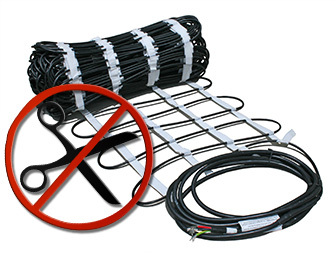 Do NOT allow heating cables to touch, cross, overlap or get bunched up. Do NOT cut or alter the heating cable. Mat tape may be cut, but the heating cable must never be cut. View the video How to Make Turns with mats. Heating cable/mats should be spaced at no less than 2-inches center-to-center and no more than 4-inches center-to-center. This also applies to adjacent heating mats. Secure the heating cable to the wire mesh or grid using plastic zip ties. Make sure that the cable/mats and the wire mesh are secure so that they will not move or shift when the concrete is being poured. The heating cable will need to be positioned 2-inches from the surface of the concrete. 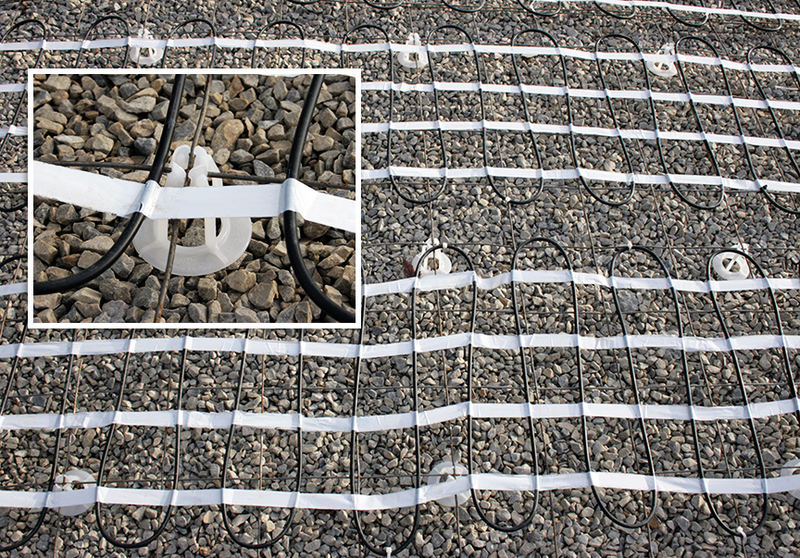 Use wire remesh and Mesh-Ups or concrete dobies/chairs to position the heating cable within 2-inches of the surface. The heating cable/mat should never rest on the ground. The joint is tooled or cut NO deeper than 1¼-inches. A 6-inch piece of ¼-inch angle iron is recommended to protect the cable any place where a control joint will pass over it. The heating cable is tightly strapped to the angle iron with plastic zip ties. Mark the forms where the angle irons are located to accurately place the control joints. Embed all of the heating cable and the splice. 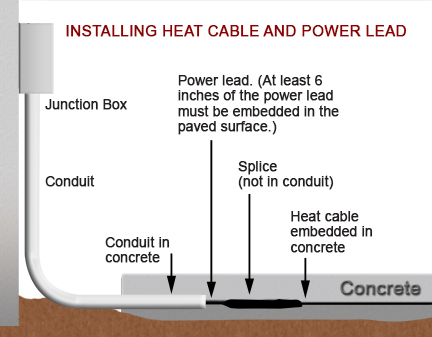 The cold lead on the heat cable and mats is not rated for direct burial in earth and must be run through a conduit. (The first 6-inches of the cold lead and splice must be embedded in the heated surface.) See the illustration showing the installation of the heat cable and power lead. Handle heating cables carefully. Use extreme care with tools such as shovels, rakes and wheel barrels to avoid damaging the cables. It is important that wiring of the system is completed by a licensed and qualified electrician and in accordance with local laws, codes, regulations, and NEC guidelines. * These tips are meant for quick reference. It is NOT a substitution for proper training and following the installation manual. Always read and follow the installation manual. Web-based training is available on request. 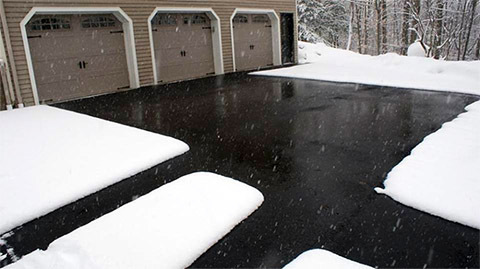 Heated driveway systems are surefire ways to enhance safety for businesses located in cold weather climates. From grocery stores to restaurants and car washes, business owners are turning to radiant heat to ensure safety and protect themselves from liability claims. Warmzone radiant heat systems are fully automated, so there’s no need for business owners to show up at the workplace early to shovel snow. The automated systems activate when an aerial or ground-mount snow sensor detects precipitation and temperatures are below a set point (typically 39°F). The energy efficient snow melting systems operate only when needed, and are also maintenance free – another favorite feature among business owners. Heating tire tracks: Rather than heating an entire driveway, install two 24-inch wide heated tire tracks. 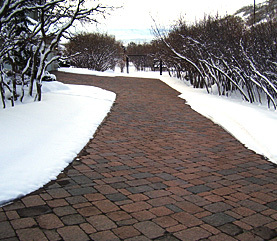 Heating the Center Strip or High Traffic Areas: Heat only an 8 or 10-foot wide strip up the middle of the driveway. Or install heat cable only in the most trafficked area of your driveway. Heat trouble spots such as inclines or where shade often causes ice buildup. Instead of heating an entire sidewalk, just warm a 3-foot wide strip in the middle; or heat the steps and heavily trafficked areas of entry points and porches. Businesses often install radiant heat to melt snow and ice in parking areas and walkways near the store front as well as in loading docks and ramps. Heating specific/custom areas: Many consumers install radiant heat only for specific needs. For example, heat dog runs or kennels to keep outdoor pets comfortable, or only heat the sloped areas of a sidewalk or just the steps. 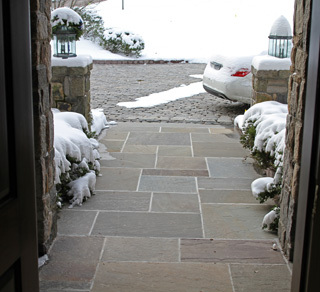 The options are virtually limitless when it comes to installing heated driveways. Visit Warmzone’s heated driveway web page for more detailed information. The information includes sections on how heated driveways work, determining the operating cost, how heated driveways work and more. 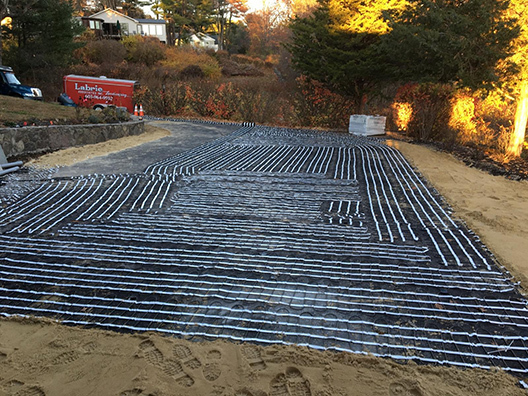 From small, custom snow melting projects to large commercial applications, radiant snow melting systems have proven to be the reliable, cost effective solution for homeowners and business owners alike. Unlike other providers of radiant heat systems, Warmzone offers free installation training courses for installers, as well as complete system design and layout services and installation support. Dealing with Warmzone makes the process of finding and installing the best system easy for customers. Installing a radiant snow melting system is not especially complicated, but there are some important steps to remember to ensure that the system is installed and performing correctly. In addition to Warmzone offering technical support for installers as well as free installation training, Warmzone provides a wealth of information online. Some resources include helpful illustrations as well as informative installation “how-to” videos that are posted online. 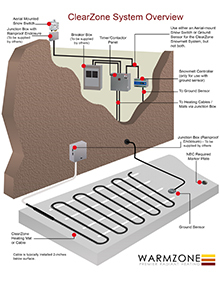 Below are samples of snow melting system illustrations and radiant heat videos. 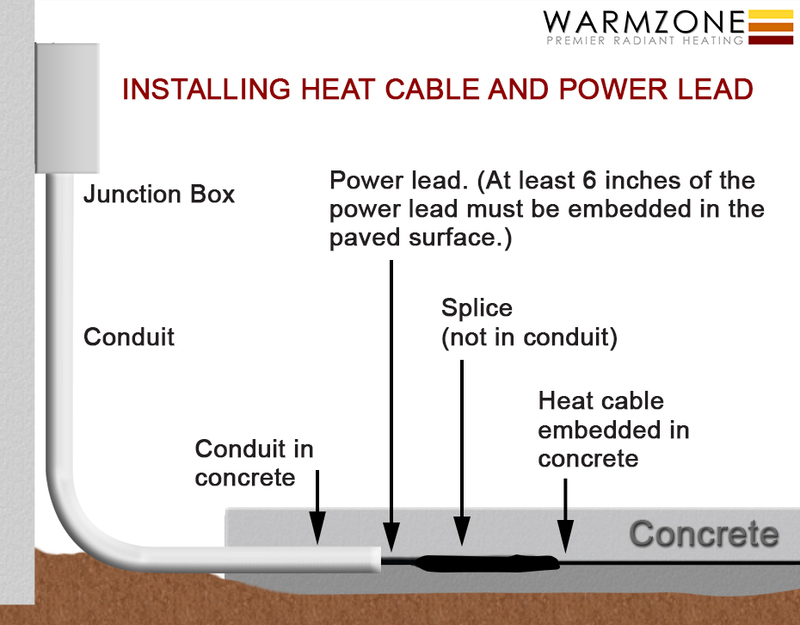 Another helpful illustration for heated driveway installations outlines how to embed the cable splice for the heating cable. 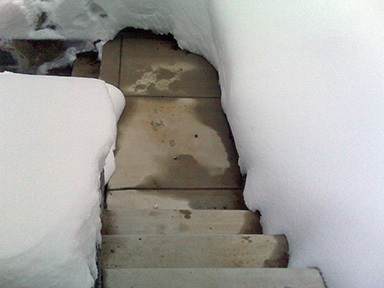 The example below shows a snow melting system installed to heat a concrete driveway. 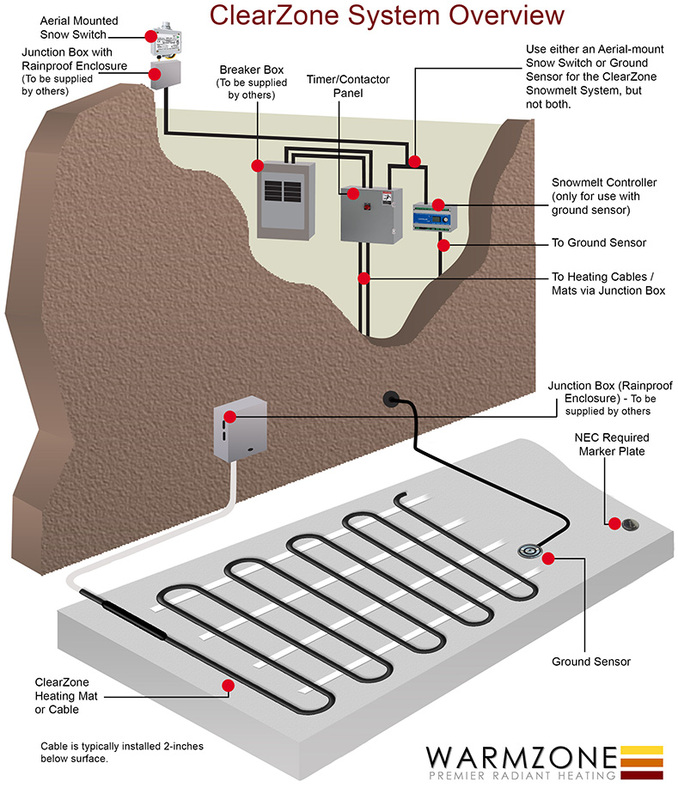 The illustration below provides a general overview of an electric radiant snow melting system and its components. 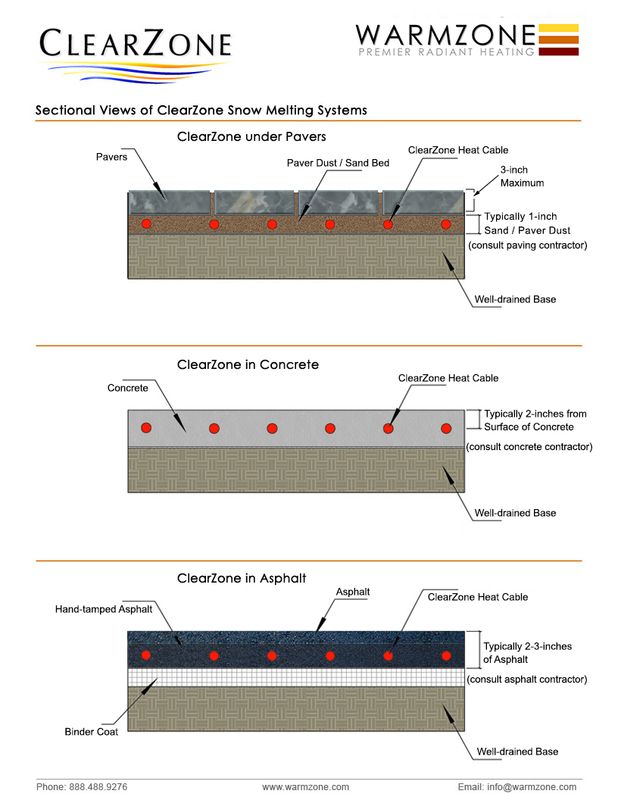 View the ClearZone Snow Melting System Overview (above). Click on the image to enlarge. Also, check out Warmzone’s online instructional installation videos. Topics range from reviewing and filling out warranty information to proper cable installation techniques and wiring of the system components. View additional radiant heat documents and illustrations. View our Installation Overviews web pages. As a contractor, are you interested in increasing your business? Are you looking for a radiant heat solutions provider you can trust? As a premier provider of radiant heat services, Warmzone has a longstanding reputation for connecting the best talent with their customers, generating more business for contractors, and greater peace of mind for consumers. So radiant heat installers benefit by partnering with Warmzone and customers benefit by having a proven, experienced contractor install their system. Warmzone keeps track of radiant heat installers and their performance; thereby maintaining a map of the top independent installers throughout the country. This assists customers in identifying the most reputable professionals in their area to install radiant heat. Initially, professional builders teamed up with Warmzone because of its trusted products and unmatched customer support. Now, knowing that they can gain additional jobs adds even more incentive for installers and also benefits consumers as well. Currently, Warmzone can recommend preferred installers in virtually any region of the country. Warmzone’s extensive catalog of proven products, awareness of current trends and profound industry knowledge currently supports a vast network of installers across the country. These resources provide impressive technical support, including complete system design and layout services, free installation training, “how-to” videos, and personal installation support. These resources are supplemented by the vast instructional documents and diagrams provided in Warmzone’s library of system manuals and technical guides residing on Warmzone’s website. Installers can put this wealth of online information to work for them and allow them to install radiant heat systems with confidence. In addition to the online information, customers can utilize Warmzone’s free consulting services so they can make the best decision when it comes to purchasing and installing a radiant heat system. Warmzone is more than a provider of radiant heat – Warmzone is a partner that is committed to offering the best customer service in the business. We are determined to see that your snow melting, roof heating or floor heating system is installed properly and performing as expected. Contractors and installers have come to particularly appreciate Warmzone’s free installation training courses. 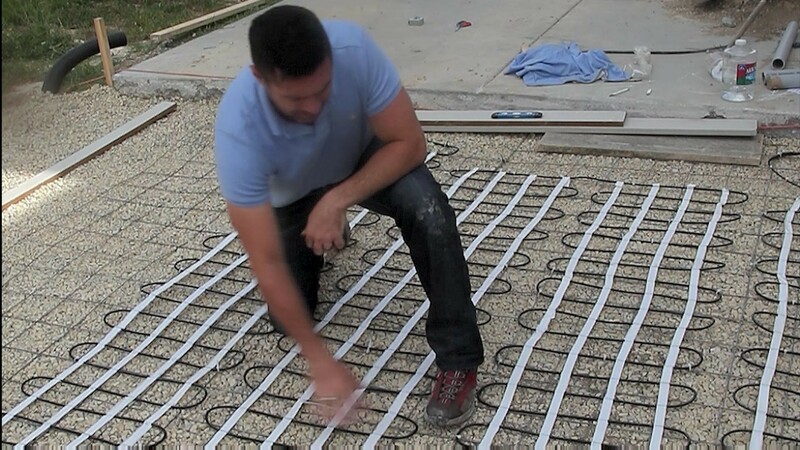 Here a radiant heat expert covers all the aspects of installing a radiant heat system. Again, this benefits the installer and the customer. If the installer still encounters any questions during the installation process, he can speak to one of our dedicated support staff to assure that the installation goes off without a hitch. Installers are never left out in the cold when they work with Warmzone. 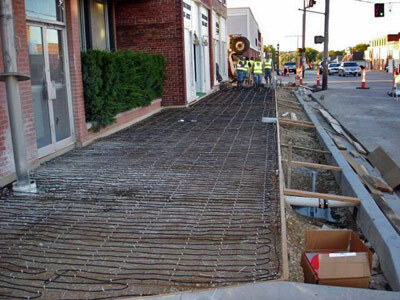 Our goal, of course, is to give construction professionals the resources and the confidence they need to add radiant heat installation to their menu of services and provide the best service to our customers. When it comes to all things radiant heat, Warmzone is the perfect partner. If you’re a contractor, it’s a great time to team up with professionals who have your back, and improve your bottom line. As a homeowner, you’ll enjoy peace of mind knowing you have a trusted installer and team of experts working for you. To learn more, call Warmzone at 888.488.9276. If you’re currently contemplating a radiant heat solution for your home, Warmzone can help you stay on top of your radiant heat installation with a comprehensive library of online resources. Whether you choose to purchase that top shelf solution from your local big box hardware store, or enlist our help, these online resources are absolutely free and available whenever you need them. Rather than mucking blindly through a home improved project, it is the informed consumer that makes the best decision. And keep in mind: a radiant heat system is only as good as its installation, so it pays to work with a professional who will walk you through the entire purchase and installation process. The prospect of researching a radiant heat project can be overwhelming if you don’t know where to look. Warmzone.com takes a deep dive into all aspects of radiant heat, allowing you to research and compare systems efficiently, including individual components and applications. The site helps you begin the process of discovering and weighing all of your options to help you make better decisions when you shop. It will also open you up to the realm of creative possibilities a radiant heat system home improvement project provides. Installation manuals, data sheets, and more! In addition to this information, Warmzone offers instructional videos you can watch in real time to help you move through all aspects of a radiant heat project, whether you are installing a heated bathroom floor, a gutter-trace system or installing heat cable for your heated driveway. Choosing Warmzone products yields big dividends for do-it-yourselfers and the most conscientious customers. By tapping a premiere provider, you benefit from the best in radiant heat technology and services available. Warmzone invests years of deep industry knowledge and experience into finding high-performing, cutting-edge radiant heat solutions for customers backed by impressive resources. Their professional design services team custom designs each radiant heat system to ensure it meets your project’s specific needs in terms of performance, installation complexity and price. You’ll know what to expect, every step of the way. Simply bring your creativity and budget requirements to Warmzone. Once you have a system design in place, our dedicated staff of experts are there to assist you throughout the purchase, design and installation process. Whether you’re researching, shopping, or elbow-deep in an installation, you can call our technical support team or reference Warmzone.com, which is always available. We take pride in offering the most comprehensive library of information available on all-things radiant heat related to help make your project a success. Call today for more information: 888.488.9276. How is a Heated Driveway Installed? 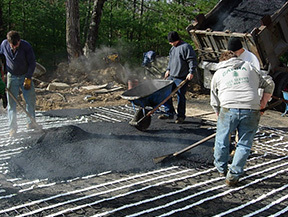 Whether you’re looking to install a radiant snow melting system in concrete, asphalt, or under pavers, it doesn’t take much to make a heated driveway a reality. The important thing to remember is that a radiant snow melting system is only as good as its installation. That’s why Warmzone emphasizes customer support services such as free training and personal installation support. But how is a heated driveway system installed? First, a Warmzone radiant heat expert will work with you to determine the specs and products that will best meet the specific needs of your custom project. After verifying receipt of the heat cable and system components, prepare the area where the system is being installed. Make sure there are no nails, sharp rocks or other items present that can cause damage to the heating cable. 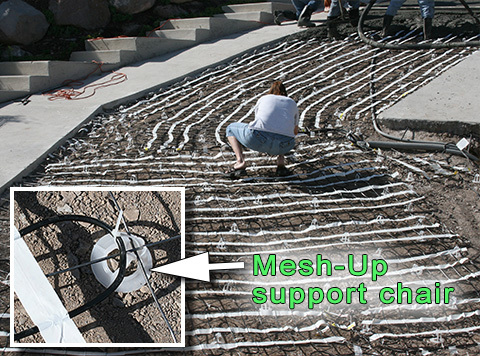 With the Mesh-Ups installed and the cable secured to the remesh, concrete can now be poured over the heating cable/mats. Take care to not damage the heating cable. A typical slab is 4-inches thick. 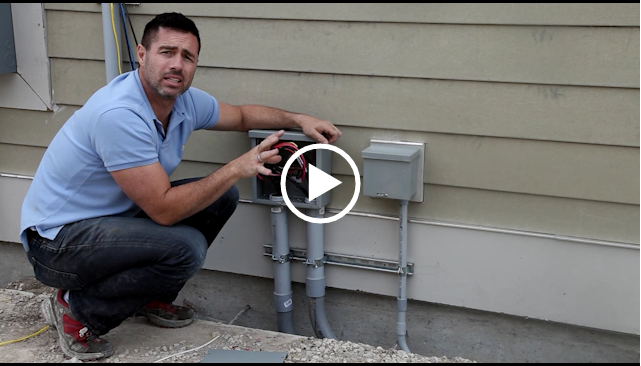 Follow your concrete contractor’s installation methods and follow all building codes. The heating cable is to be within 2-inches of the finished surface. 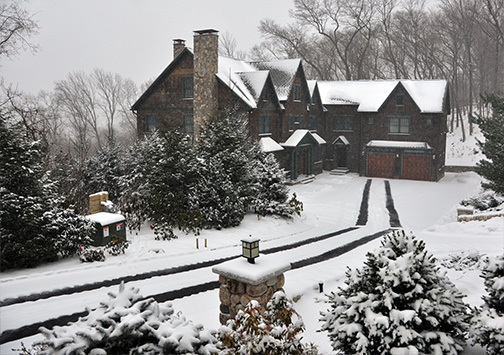 Most heated driveway systems utilize an aerial mount snow sensor to activate the system. This is typically installed at the roof’s edge where it has open access to the elements. 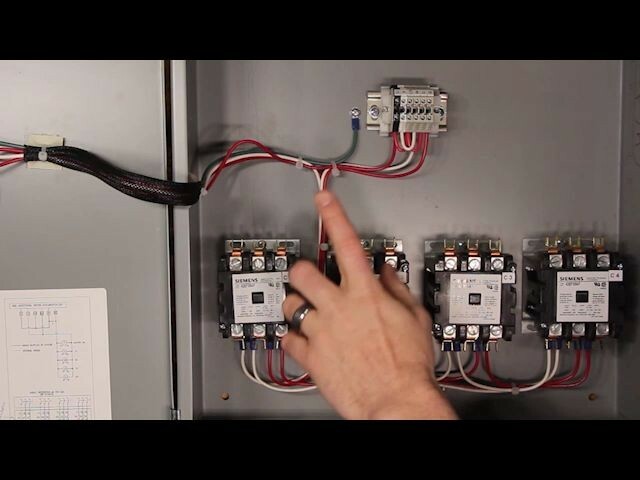 When precipitation is present and the temperature is below the set point (usually set at 39°F), the sensor signals the contactor panel and power is then sent to the heat cable. View additional “How to” Videos from Warmzone. Important Note: For warranty and safety purposes, it is necessary for a qualified electrician to connect the system.